Paul Helm (left) as Marcus Moscowicz and John Wascavage as The Suspects in Murder for Two. The Utah Shakespeare Festival recently opened five plays, three greenshows, and a new theatre; but the excitement continues. Two more plays are set to open over the next three weeks as the Festival christens the new Eileen and Allen Anes Studio Theatre. William Shakespeare’s political masterpiece Julius Caesar previews July 29 and opens July 30. 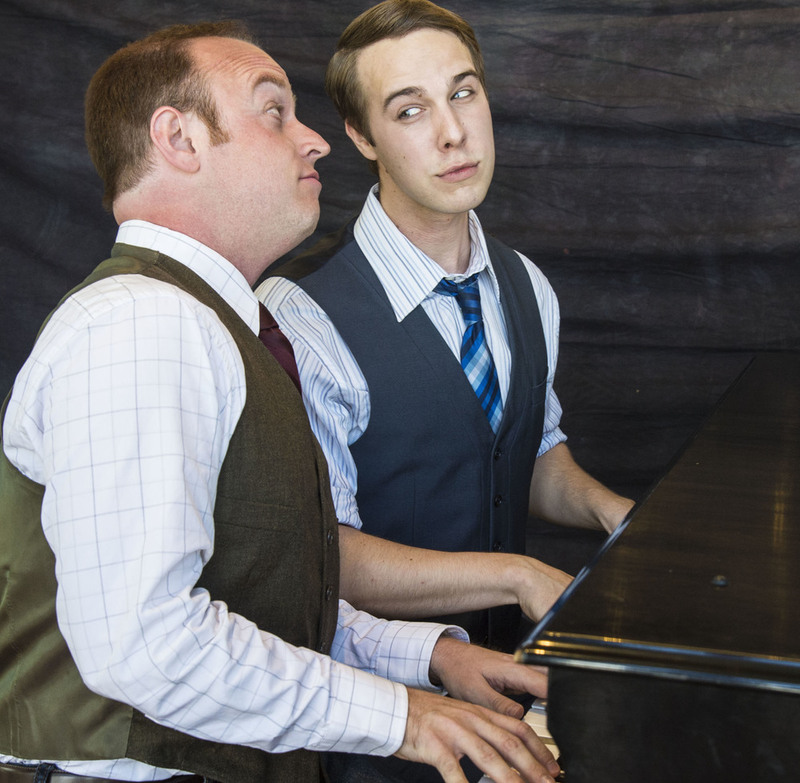 The hilarious musical murder mystery Murder for Two previews August 4 and opens August 6. Directed by Joseph Hanreddy, Julius Caesar runs through October 22. Hanreddy’s credits at the Festival include adaptor/director of ­Sense and Sensibility in 2014, adaptor of Pride and Prejudice in 2010, and director of Macbeth in 2010 and Private Lives in 2009. The play’s numerous roles will be played by twelve actors, led by Paul Michael Sandberg (who last appeared at the Festival in 1991) as Julius Caesar, Jeffrey Cummings (at the Festival in 2008) as Marcus Brutus, Rex Young (who appeared here in 2003 and 2004) as Caius Cassius, and Sam Ashdown (who is playing Henry V this year) as Mark Antony. In Julius Caesar, Shakespeare poses questions that we are still asking 400 years later: When people can no longer trust their elected leaders, what do they do? Do they remain loyal, or do they stab their opponents in the back? Especially poignant in an election year, it is a dazzling masterpiece of betrayal and faithfulness, treachery and trust. “Julius Caesar is a tremendously relevant play to our current political debate,” said Hanreddy. “The Anes Theatre has allowed us to design a unique seating arrangement that will support an intimate, visceral, visually exciting production, as well as invite the audience to play a vital part in the storytelling. Murder for Two is directed by Brad Carroll, who has directed numerous Festival plays, including South Pacific, The Comedy of Errors, Les Misérables, The Mousetrap, H.M.S. Pinafore, and Lend Me a Tenor: The Musical, which he also co-wrote. This two-actor comedy also plays through October 22. Everyone is a suspect in this two-person hilarious musical murder mystery with a twist: One actor (Paul Helm) plays Marcus Moscowicz, a police officer, would-be detective who investigates the crime. The other (John Wascavage) plays all the suspects. And they both accompany themselves on the piano! This zany blend of classic musical comedy and madcap mystery is a highly theatrical duet loaded with killer laughs. Both actors are new to the Festival this year. In addition to their work in Murder for Two, they both appear in The Cocoanuts: Wascavage is playing Robert Jamison (Zeppo) and Helm is the associate music director and a member of the band. Tickets for these two plays and for the currently running plays are all available on the Festival website at bard.org or through our Ticket Office at 1-800-PLAYTIX.